Neuroplasticity is important because during rapid periods of brain growth, synaptic pruning occurs. Synaptic pruning is the elimination of synapses in the brain that are weaker facilitating growth of a stronger, more efficient brain.As the brain grows, starting with a newborn, its neurons will develop synapses, which link neurons to neurons and transmit information through one another. At first this growth is uninhibited. However, as the infant reaches toddler age, the brain begins to eliminate some synapses between neurons in order to help the brain transmit information more efficiently. The synapses and neurons that were activated most during growth are the ones that will be preserved. This process helps to create a brain better equipped to absorb knowledge.To optimize synaptic pruning, some studies show that "a specific learning process" may help the brain form itself into a more useful tool. This is one of the benefits of listening to positive ’’’Self-Talk’’’ several times a day. Repetition helps reinforce our beliefs. The study found five criteria that are based on neuroplasticity. The first, attention, stresses the need to hone the development of this skill during the first five years of life- the years with the most rapid brain growth. Second, priming, or the acquisition of knowledge through sight and sound, may reshape the synapses of the brain based on stimulus. Practice, the fourth criterion, also uses neuroplasticity to absorb knowledge into the brain. The fourth and fifth criteria are related to language. Learning and rule learning both demonstrate that the sooner these elements of education are specified and controlled, the more likely the brain will have a better synaptic pruning process. In other words, the more weak synapses will be eliminated. Eagar to Learn reports that once English orthography, a component of rule learning, is set in the brain, the brain becomes strongly resistant to change. Based on these criteria, in combination with the understanding of the process of neuroplasticity and synaptic pruning, several observations may be made. First, we understand that the greatest amount of synaptic pruning occurs during the most rapid period of growth for the brain, or during the earliest years of a child's life. Second, when "a specific learning process" is provided for a child, the more successful synaptic pruning becomes. Thus, we may conclude that in order to prepare the brain of a child for the most proper education, it is best to introduce positive ‘’’Self-Talk’’’ during the earliest years of life. Judging from these studies, my observations, I feel that one may confidently conclude that addressing ‘’’Self-Talk’’’ of children while they are youngest is most beneficial not only for their education, but also for the physical development of their brains. This information is useful in many fields of study- the sciences, sociology, political science, law, etc. 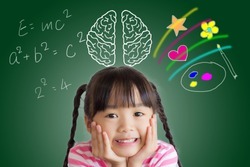 Neurosciences still have much to develop on early childhood cognitive development.